What is a Fireplace Rebate and How to Work Out What I Need. How to measure a fireplace surround rebate. We have created a video explaining rebates, please click here to view it. Fire surrounds have a space around the inside of the legs and fascia, this is to allow the surround to fit over your back panel, we refer to this as the rebate. Without a rebate a back panel would need to be made exactly the same size as the fire surround opening (our measurements C & D), this would make the fitting extremely difficult and the end results unsatisfactory. 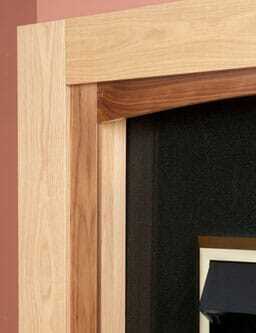 With a rebate, the back panel fits behind the fire surround. Our fire surrounds all come with a rebate of a 1 inch, and removable rebate strips that gives you a 3-inch rebate. We can alter this if your back panel is a different thickness. Below is a visual explanation on how to find out the rebate you require, but please call us if you are unsure. Work out the rebate by measuring from the wall to the face of the back panel (A). Standard granite or marble back panels supplied by us require a 1-inch rebate. Unless otherwise stated all our surrounds come as standard with a 1-inch rebate this can be increased to 3 inches by the removing of 6 screws. You do not need to inform us if you require a standard 1 or 3-inch rebate. If you are fitting to a flat wall then you will need a minimum 3-inch rebate to allow space for the fire to fit. See our video. 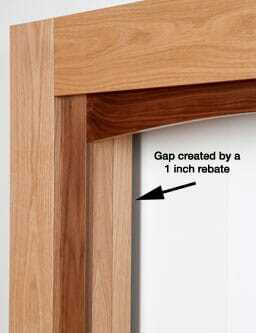 The arrow is pointing at the gap created by having a 1-inch rebate, this goes all the way around the inside of the surround it allows a back panel (as shown above) to fit behind the legs. The inside of the legs will now sit flat on the face of the back panel, and the outside of the legs will sit flat to the wall. 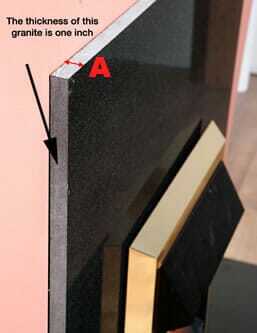 You would request a fire surround without a rebate if you are not fitting a back panel to the wall. You would request a non-standard rebate if you are using tiles, or your back sits further or closer to the wall. The fire surround is shown here with the Granite back panel in place, the back panel is going behind the legs of the fire surround. The inside of the legs now sits flat against the face of the granite back panel and the outside of the legs sits flat against the wall. Most people are not fitting surrounds every day, it is understandable to be confused by rebates. We, on the other hand, deal with them every day and are more than happy to help you every step of the way. Please call us if you are unsure about anything.